View cart “Sensitive” has been added to your cart. 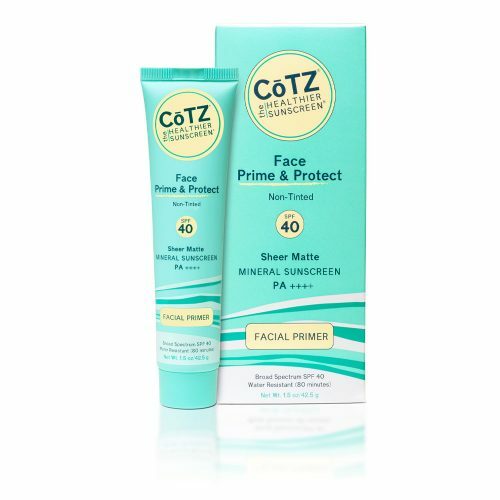 CōTZ® Face Prime & Protect SPF 40 is a sheer mineral sunscreen providing broad spectrum UVA-UVB protection in a silky, translucent primer. Layers beautifully under makeup or can be used alone for a smooth matte finish. Non-tinted formula is ideal for lighter skin tones. Warnings: For external use only. Do not use on damaged or broken skin. Stop use and ask a doctor if rash occurs. When using this product, keep out of eyes. Rinse with water to remove. Keep out of the reach of children. If swallowed, get medical help or contact a Poison Control Center right away.